Solomon Islands head coach, Jacob Moli, fielded a much younger side compared to the game on Thursday with most of the players getting their first taste of international football. The team showed sparks of brilliance but the goals failed to come. Vanuatu were a better side on the pitch than in the first friendly earlier in the week and showed more hunger for goals and almost getting them on several occasions. 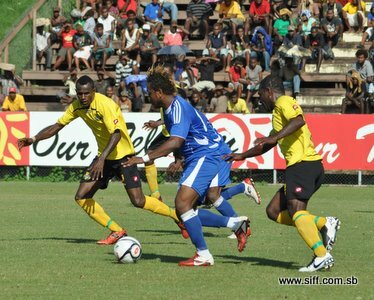 Defensively, they performed better and kept the speedy Solomon Islands forwards in check. The pace of the game right from the opening whistle was blistering with Solomon Islands dominating the first 15 minutes and Vanuatu were forced back into their own area. Ten minutes into the match the local fans were denied their cheers when Ian Paia headed the ball just millimetres over the cross bar from a corner kick. Two (2) minutes later futsal international and Amicale forward, Jack Wetney, slammed the ball wide from outside the penalty box. Vanuatu took their time to get in the game but when they did Solomon Islands’ control of the game was snapped away in an instant as they started pushing forward with numbers. This proved to be effective only up to the opposite penalty box where the Solomon Islands defenders scrambled the ball away. Like on Thursday, Robert Tasso, was Vanuatu’s danger man and twice in the first half he threatened to put the visitors in front. His first shot forced a low save from Jimmy Qwaina and the second was a free kick which required a precise finger tip save from the Solomon Islands keeper who was making his first ever international appearance. On the other end of the day Ernest Bong was also kept busy by Paia and Carrol Kakate who pounded the Vanuatu goalkeeper with shots but he was totally up to the task and kept the young Solomon Islands strikers from getting on the books. Without any goals in the first half the Solomon Islands side looked more frustrated than their opponents and Moli was not happy with his boys at halftime. For Vanuatu, it appeared that their defensive pattern was holding and they did not appear too concerned about not scoring. Like in the opening minutes Solomon Islands started the second half with more composure but Vanuatu were too confident at the back and kept them shut away save for a few times which they managed to break through. Those times that they did they were met with Bong’s safe pair of hands and feline reflexes. Solomon Islands’ best chance of the second half came from a free kick taken 35 yards out from the Vanuatu goal mouth and at a tight angle. Joachim Waroi scored some great free kicks for Marist Fire in the Telekom S-League and he almost sent the ball all the way had Bong not pulled off the best save of the day. Heading towards full time Solomon Islands pushed hard for a goal but they were denied by the strong Vanuatu defenders and at times by themselves when they failed to hit the target. Dennis Ifunaoa went in as substitute but he could not give the local crowd something to cheer about. Vanuatu were not under as much pressure as Solomon Islands to win but still they wanted to embarrass their hosts in front of their fans and replied through counter attacks. The Solomon Islands back four of Loni Qaraba, Hadisi Aengari, Stanton Hila and Timothy Joe did well to deny the Vanuatu forwards and at times they had to employ unorthodox methods to safeguard their penalty area. Any hope that the local side could still pull of a win were put to an end when Nelson Sogo sounded the full time whistle 1 minute into extra time. Moli was unimpressed by his team’s failure to score but acknowledged that Vanuatu were more composed at the back and made things hard for Solomon Islands. Solomon Islands will travel to Vanuatu for the return matches on July 27 and 30, the latter being the national independence anniversary day for Vanuatu.